On September 20, 2013, I challenged my college level World Mythology class to embark on their own Monomyth. For the past four months they have been on their journeys, succeeding, failing, and changing direction. Tonight, over dinner and dessert, they present their journeys to their families, staff, and administration. I am exceptionally nervous. You see, I’ve never done this before. Have never said, “Hey kids, go change your lives and document the change, because you’ll be graded on it.” I have often thought during this semester: What am I doing? That’s because there have been other end-of-the-semester presentations, but they have been of the academic bent, highlighting research. Throughout the semester I have demanded high academics, so the course has not suffered, but this direction I’m taking the culmination has not been done. And like with all new things, I’m second-guessing my choice. Not because of the students’ presentations, but because of the potential reaction. It is my sincerest hope that the audience gets this. I want them to see that the purpose of education, in regard to mythology, is not to learn every name of every god and goddess, nor every creation and flood myth, but to understand the nature of storytelling. All our lives our stories: the ones others tell about us, and the ones we tell ourselves. Throughout the course I have asked the students to look for this again and again: myth as a suggestion for how to live. 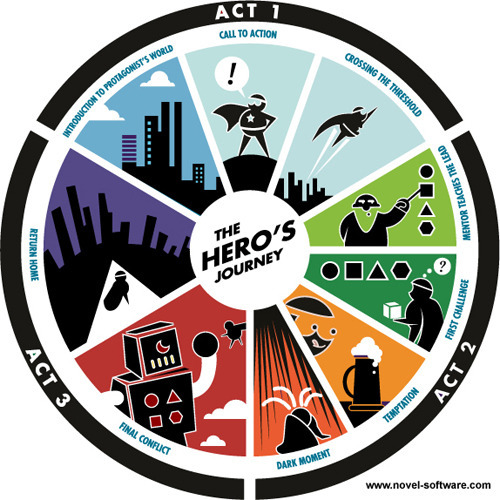 And in the Monomyth, often the ordinary individual becomes the hero. I cannot think of a better message to send to my students. I want them to see that being the hero is recognizing you are the narrator of your life. Narrator does not equal master. Often life moves out of our control, and this truth must be accepted. However, that does not leave us powerless. We can focus on the details that matter, and we can shift the story’s perspective, so the tragic is a blessing, and the mundane, paradise. Therefore, it is my greatest hope that the families and staff gathered will understand my premise, that to properly educate is to simply tell a story. One that’s been told countless times. The trick, however, is to tell it in a way that entices and that asks the listener to question it, and to analyze it, and in some way, make it his or her own. Tonight, we will all teach one another, and then let the stories echo, and live on.